My design firm made two kisoks for shows at the MoMA. 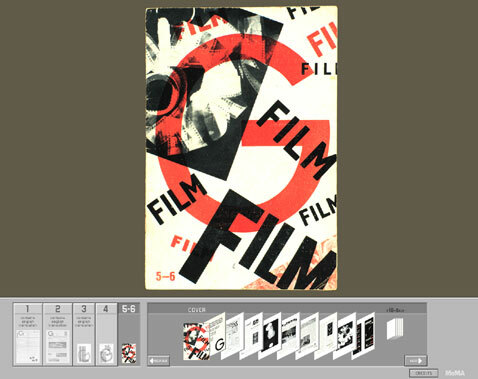 The MoMA was showing some rare Russian avant-garde books and asked us to make virtual books for users to flip through. We designed virtual books that took into account the stiffness of the paper stock in each book and book cover. I enjoyed the simpleness of the interface and it was one of the first kiosks that MoMA staff felt was unobtrusive and added to the experience of the original material. Our second kiosk was for the "Mies in Berlin" show. The challenge was to create a natural interface to browse the many different size formats (long format magazine, large broadsheet) that Mies' "G" magazine came in while also including, unobtrusively, interface elements to play films and music within the experience of the printed page.